So, even though I workout, I've learnt the importance of eating a balanced diet (years ago, I tried going on diets and counting calories, but they failed because I just love to eat and get hangry otherwise!). I am a staunch advocate of fresh cooking and am also very against fast food chains. In terms of what and how I eat, it consists of 'normal' cooking, the occasional burrito or pizza (I admit they are my guilty pleasures and the exception to my anti-fast food rule) and increasingly over the year, 'clean eating'. What's your guilty pleasure? What is clean eating? It has definitely gained popularity over here in the UK the past few months so those of you here may be familiar with hearing about it, but not knowing what it is. (Millie Mackintosh is one celebrity who eats clean). In simple terms, it's about eating food to as much of a natural state as possible. Sounds weird right? Are you picturing the plainest of salads? Don't worry, I did when I first came across the phrase. When I first began to change what and how I eat, I did some research and was very surprised to find that clean eating is much more colourful, exciting and interesting than I had ever thought. I want to share with you some of my favourite websites and phone apps that have really helped me to change my view on food, helping me to eat more clean. More importantly, they all have such great recipes, and quite often they are very quick and easy. Deliciously Ella has a both a blog and phone app. Every time I have made something from her recipes, I found them very quick and easy to make. This is mouth watering stuff, catering for breakfast, luch, dinner, dessert and more importantly snack time! I made her sweet potato brownies, which were chocolate heaven! Even my brother, who snubs clean eating, loved these and devoured half of them! Life Gain can be found on instagram, plus recently she created a phone app of her recipes, also called Life Gain. Whilst the app is fairly new and basic, I really like it because the recipes are the most simplest and quickest from all the apps I use. She's going to be adding more and more recipes to the app. 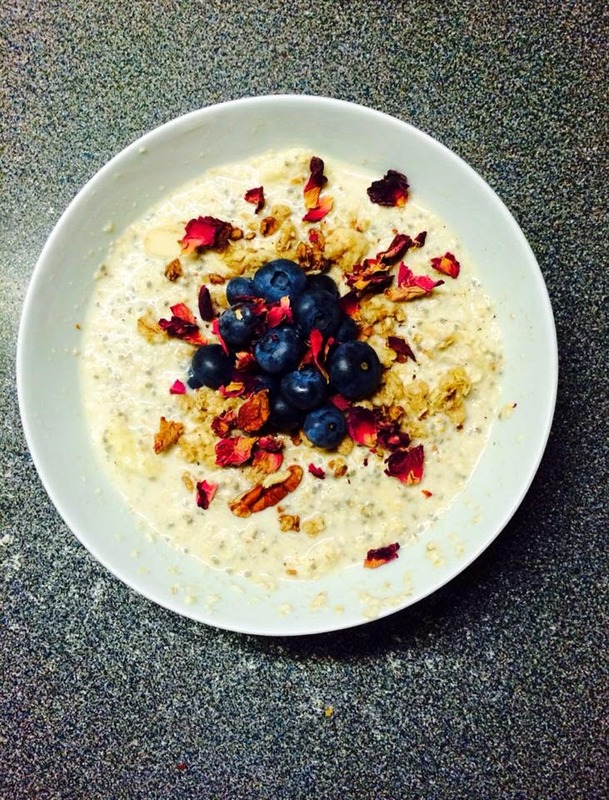 One of my favourite recipes is her Overnight Chia Oats recipe (partly because I am obsessed with chia seeds!). The beauty with overnight oats recipes in general is that you make it the night before so when you wake up, breakfast is made. Plus, in the summer, you can eat it cold (so refreshing) or, in the winter heat it up (with a cafètiere or tea pot of course). With mine, I took away the goji berries, went heavy on the blueberries, and added shredded coconut and dried rose petals. This makes me look forward to having breakfast all the time as it's so creamy, fruity and slightly sweet! This is an Australian Iphone app I found recently. I made slices of baked apple as a dessert for the family (I'm also a little obsessed with dates), and used the recipe from Clean & Green. This was sweet, just as a dessert should be, but it was perfect as a dessert and helped me to win my mum over to clean eating! I devoured the apple slices before I could take any photos of them. Chocolate Covered Katie is one of my favourites. Full of chocolate recipes, my kind of blog. I am obsessed with protein balls (also called oat balls). CKC has a tonne of recipes for different types of oat balls. I've made so many different protein balls over the past few months, but I kid you not, CKC's German-Chocolate Fudge Bites were the best I've ever made. Unfortunately for you, I loved it so much, I made several batches of these but ate them all before I could even take a single photo of them (as my mum likes to jokingly say, "greedy guzzling brat, that's why you're always fat"). Seriously though, these are amazing. She's another one of my favourites. She's a fully qualified nutritionist, and has plenty advice on eating healthy with lots of great clean eating recipes. Anyway, remember I said I love eating oat balls? Well I made these ones recently. Seriously addictive stuff and matches well with black tea. Once you pop, you just can't stop! I do love cupcakes too, so I also made these recently- dairy and gluten-free, though the frosting is made from greek yoghurt (frosting made healthy!). 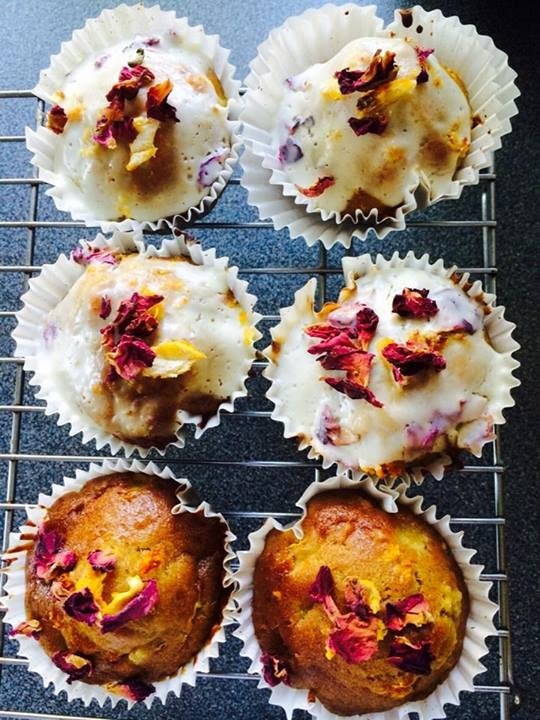 They're orange and rhubarb cupcakes. So sweet they matched well with both black coffee and coffee with milk. In fact, these were perfectly moist and oh my gosh the tangy, zesty orange smell that wafted through the house when these beauties were baking in the oven was amazing. In fact, they went down so well with the family, I made two batches of these on two different days! I really do eat other food besides these lovely, healthy sweet treats! Disclosure: This post is not sponsored in any way. All opinions are my own. Please seek professional advice on nutrition.